Seaton Grant is not recorded in any of the references normally used for pottery and ceramics, but then, the Rameking is not known for using the normal references. Seaton Grant seems to have had a small output, mainly only dishes and ramekins. Pieces occasionally come up on E-Bay and other Internet sites but go for very little money. There is an example of a "Mickey Mouse" dish. This would have come out following the advent of Disneyland on television in Melbourne in the 1950s. Most of his pottery is advertized as being either 1950s or 1960s. It is all 1950s! Signature “Seaton Grant” is both incised on some and handwritten in pencil on others. There was an advertisement for homewares by him in Hobart 1n 1951. They are well made and the ceramic, glaze and handles are very similar to those made in the late Diana Pottery stage. (Check their small “wheatsheaf” pattern). Maybe he worked there, maybe not, any suggestions? The “Seaton Grant Potteries Limited” operated from 80 Silverdale Road Eaglemont, Victoria. It was one of those short-lived companies that started after the Second World War. He operated as a sole trader until 1953 when he became a Limited Company. The company ceased trading on the 25th of October 1955. Their last meeting was on the 28th of December 1961 and Seaton Grant Potteries Limited was removed from the list of companies in 1963. Geoffrey is listed as a “manufacturer” on the Electoral Roll. He is later recorded as a “consultant”, living in an affluent northern suburb of Melbourne. .
Now this morning I have been looking at Geoffrey Seaton Grant. I think he is alive and kicking !!! Ramekins of his I have seen. 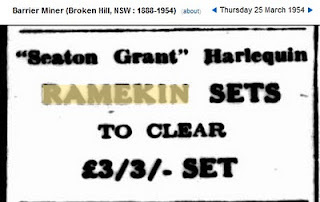 The surname is Seaton Grant and the Rameking notes five people who were partners in his business in Eaglemont, Victoria at 80 Silverdale Road up until October 1955. It might have ended a year earlier .... there was an auction of those premises on Wed 13 Oct 1954. But what really rocked me was that an article appeared in the January 22, 2016 Frankston Standard Leader !!! This is interesting too ! When 87-year-old Geoffrey Grant’s car stopped suddenly in the middle of the road he never thought it was because someone had deliberately damaged his car. An international sculptor originally supplying ramekins to American soldiers during World War 2, the Seaton Grant artist said he was probably home when the offenders broke into his back garage, which was locked, and attacked his car." yes is appears it was his family who he no longer has contact with disgusting!! !